C Sumitomo Constr. 1993 18 72 6815 60 minutes from downtown. Situated at the mouth of the Bang Pakong River, the Royal Lakeside Golf Club enjoys beautifully refreshing sea breezes and surroundings. Shrubs and flowers surround greens and fairways, some of which run right to the riverbank. The centre piece of the resort is a stunning white clubhouse, which can be reached by riverboat and by virtue of a round on the fast immaculately-kept front or back nine. 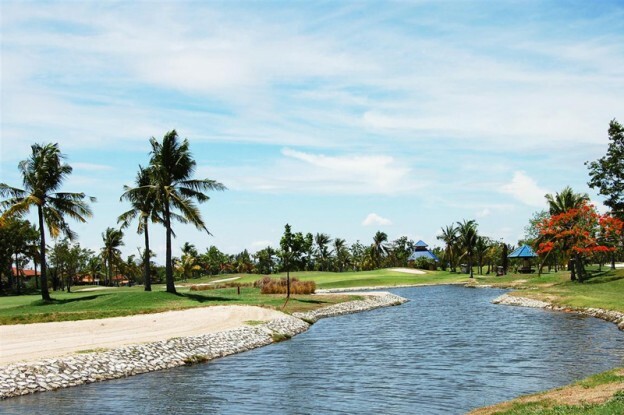 Some holes run right along the Bangpakong river bank., from the white tees the course gives the average handicap golfer the chance to make a few pars, especially on the par-three holes. The greens are fast and true on the fairways and bunkers are always kept in immaculate condition. Inside the dazzling white clubhouse the ambience is very pleasant.